The town of Velletri is located 30 kilometres south-east of the city of Rome. In 1803 King Henry IX and I was named Cardinal Bishop of Ostia and Velletri. The Museo Diocesano (also called the Museo Capitolare) is located next to the Cathedral of Velletri. The museum owns two chasubles of King Henry IX and I.1 One of these is made of white silk with a floral design; it is laminated in silver with gold embroidery and a ducal coronet over Henry's coat-of-arms. The other chasuble is made of violet silk with a floral and geometric design; it is laminated in gold with gold embroidery and a royal crown over Henry's coat-of-arms. The museum also owns a set of rose silk vestments (a chasuble, dalmatic, and tunicle) which were the gift of Cardinal Raffaele Monaco La Valletta. They were made from the mantle of Queen Maria Cristina of Naples (youngest daughter of King Victor, and sister of Queen Mary III and II). The vestments are decorated with the Bourbon fleur-de-lis. The museum is open daily from 10.00 a.m. to 1.00 p.m. and from 3.00 p.m. to 7.00 p.m. It is closed January 1, Easter, August 15, and December 25 and 26. Entrance fee L6,000. A guided tour is given in Italian on Sundays at 11.00 a.m. There is also an audiotour available. 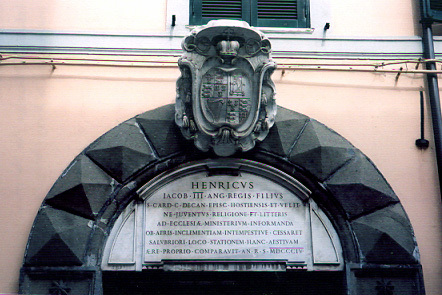 The entrance is located at Corso della Repubblica, 347.
in the year of salvation 1804. There is frequent train service from Rome to Velletri; the train station lies at the bottom of the hill towards the southern end of the town (near the Cathedral and the Museo Diocesano). There is also a regular bus service from Frascati (via Albano) to Velletri; buses terminate at the northern end of the town in Piazza Garibaldi. 1 Fausto Ercolani, La Cattedrale di San Clement I P.M. e il Museo Capitolare in Velletri, Itinerari d'Arte e di Cultura: Basiliche (Rome: Fratelli Palombi, 1988), 65-66. In May 2002, neither of these chasubles (nor the vestments of Cardinal Raffaele Monaco La Valletta) were on display; they could formerly be seen in Room II (at one time Room III) of the museum. 2 Translation prepared by Jonathan Orsi. Image 1 (Coat-of-arms and inscription): © Noel S. McFerran 2002. This page is maintained by Noel S. McFerran (noel.mcferran@rogers.com) and was last updated April 8, 2012. © Noel S. McFerran 2000-2012.